There are a lot of people you should never accept free food from: your plumber, your drug dealer, the guy who sits on the sidewalk by your apartment and eats glue. Fortunately, Wendy's does not fall into any one of those categories. 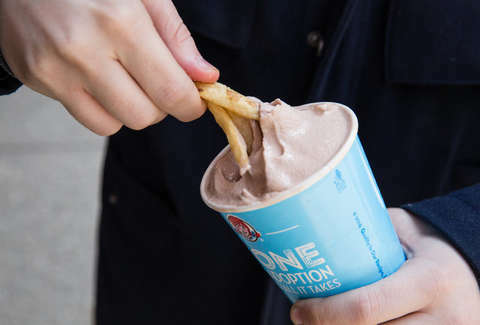 And thank god for that: Right now, out of the kindness of their little ginger hearts, Wendy's would like to gift you one of its signature Junior Frostys in chocolate or vanilla every day for a year on the house. That's right -- a year. Because nothing in life is really free, you'll be required to purchase a $2 key tag for charity. But by basic financial math, that's a reasonable trade off for 365 soft-serve swirls, which would ultimately set you back $333 more (plus tax) if you were to purchase them on your own. To redeem your mountain of frozen dairy, check the chain's list of key-tag vending locations, and find your nearest locale. Drop $2 on the nifty tag, add it promptly to your key ring, then enjoy the first of your legion of Wendy's desserts. Designed in partnership with the Dave Thomas Foundation for Adoption, an organization that dictates is mission as, "finding a loving family for every child waiting in foster care to get adopted," the tags are for a good cause -- beyond your own sugar intake. Wendy's has pledged to give 85% of all sales directly to the foundation, so you can rest assured that your $2 is well spent. There are no gimmicks, no added fees, no secret passwords. You just have to grab your tag before December 31, 2018, when sales end (it'll be valid until December 13, 2019). Then, each time you hit up your local Wendy's, you'll simply have to flash your key tag at the register. It's not a hoax, we swear. That little piece of plastic will be your ticket to a 2019 that's far sweeter than the year before. Either way, it can't really get much worse than 2018.